Tomorrow is Halloween, dear readers. All Hallows’ Eve. Sam hain. The winter solstice is the longest night of the year, but tomorrow’s just might be the darkest. 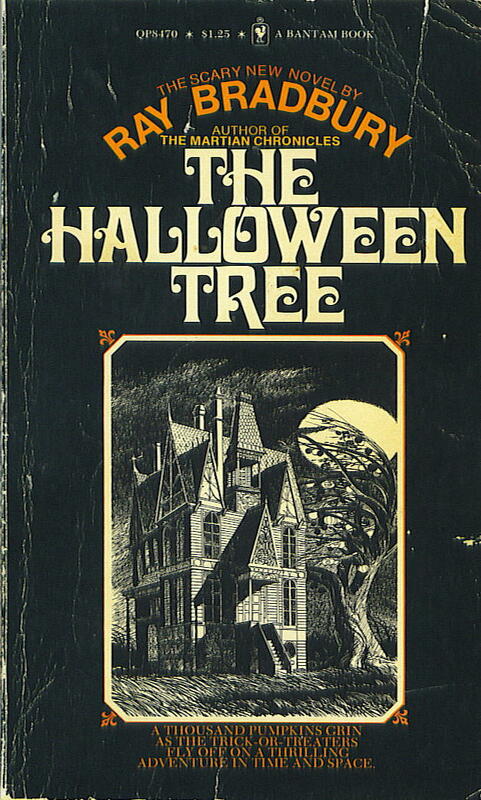 We started the month out with a look at Ray Bradbury’s Something Wicked This Way Comes, and we’re going to close the month today with an excerpt from his 1972 ode to the spirit of the season, The Halloween Tree. Enjoy. “The pumpkins on the Tree were not mere pumpkins. Each had a face sliced in it. Each face was different. Every eye was a stranger eye. Every nose was a weirder nose. Every mouth smiled hideously in some new way. There must have been a thousand pumpkins on this tree, hung high and on every branch. A thousand smiles. A thousand grimaces. And twice-times-a-thousand glares and winks and blinks and leerings of fresh-cut eyes. And as the boys watched, a new thing happened. The pumpkins began to come alive. One by one, starting at the bottom of the Tree and the nearest pumpkins, candles took fire within the raw interiors. This one then that one and this and then still another, and on up and around, three pumpkins here, seven pumpkins still higher, a dozen clustered beyond, a hundred, five hundred, a thousand pumpkins lit their candles, which is to say brightened up their faces, showed fire in their square or round or curiously slanted eyes. Sparks leaped out their ripe-cut ears. ‘The strangest sight you’ve ever seen. From the gourds hung high on the Halloween Tree. The cover image for this post is Joseph Mugnaini’s original cover art for the first edition of the book.